Additional fields are available for Salesforce, Google Calendar, and FileMaker sources and will be available for Basecamp sources soon. 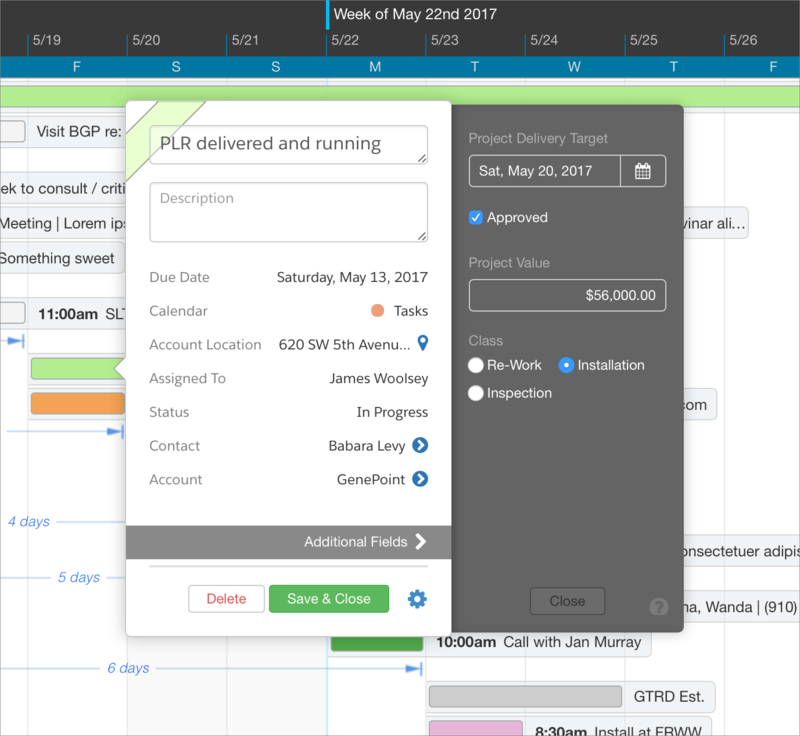 In addition to the fields like Title, Description, Date, and Resource that DayBack provides, you can map additional fields so that users get a complete picture of items on your calendar. This can be especially helpful if you have required fields that need to be populated when an event is created. Additional fields are also available to Calendar Analytics so you can sum and chart these values over time. 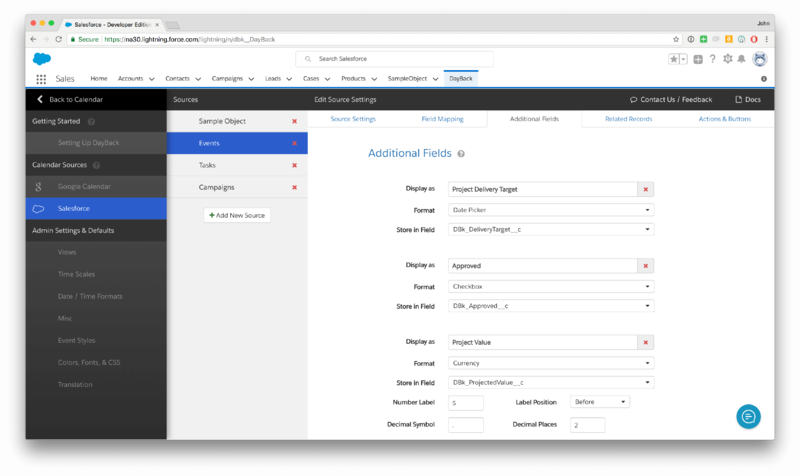 You'll be able to configure the formatting of your additional fields and even create pick lists that can match the picklist values you're using in Salesforce. Clicking on "Settings" in the calendar's left-hand sidebar will reveal an "Administrator Settings" button that will let you select your calendar sources and configure additional fields. Click "Administrator Settings" in DayBack's "Settings" tab and click your source (Salesforce, Google, etc.) under Calendar Sources in the left-hand sidebar. Select the source you want and click on the "Additional Fields" tab. There you can click "Add New Additional Field" to add a field to DayBack's popover. Format: here you'll determine what the formatting options are (is it a date picker, or a currency field, for example). See "Formatting Options" below. Store in Field: deepening on the format you select, you'll see a list of Salesforce or FileMaker fields which match the data type you've selected. You'll almost always be able to select any text field as well since you can put numbers, etc. in text fields, though you may not want to. When you're done configuring your additional fields, scroll down a bit further and click "Validate Field Mapping" this will make sure that everything you've set up will work in your original data source. You can create as many additional fields as you like and they'll appear, in the order created, in the "drawer" to the right of DayBack's popover under the heading "Additional Fields". You can change "Additional Fields" to say something else in DayBack's translation tab. Here are the different field options along with any behaviors unique to then. We encourage you to play around and see which formats work best for you. Edit Box - This is an expandable text box that you can point at any text field you have in Salesforce. Number - A simple number field with lots of formatting options including leading and trailing labels (like "each" or "kg"). Under the hood only the numeric value of number and currency fields is sent to Salesforce: currency labels, etc. are not. If you choose to round a value by adding a number of decimal places, DayBack will round the value when displayed in the popover, but send the actual entered value to Salesforce. So if you set up your field to show two decimal places and enter 4.138, DayBack will show 4.14 but send 4.138 to Salesforce. Currency - A special number field to which DayBack will add some default formatting. Feel free to change your currency symbol and alignment to suit your preferences. Percent - Like currency, this is a number field that DayBack pre-formats for you. Feel free to change the formatting. URL - A text box above which DayBack will render a "go" button so users can open the URL by clicking on it. You don't have to enter the http or https prefixes if you don't want to. Checkbox - This will show a single checkbox beside the field label (like "approved" at the top of the screen. This can be pointed at text or boolean fields in Salesforce. The value "true" will be set into whichever field you choose here. Radio Button Set - Like "Class" in the screenshot above, you'll be able to select one of the values you enter in List Items which makes up the pick list for this field. Separate your values in List Items by commas. If your field uses a pick list, enter the possible values into List Items: we hope that a future version of DayBack will pull these list items from Salesforce for you. Picklist - This option presents your List Items in a new drawer and lets you select one or more of them (multiple selection is an option for this format). The values you enter in List Items make up the pick list for this field: separate your values in List Items by commas. If you'd like to include a comma IN your values, just enclose in single quotes like this: Sindelar',' John. If your field uses a pick list, enter the possible values into List Items: we hope that a future version of DayBack will pull these list items from Salesforce for you. Date Picker - You can use this for any date or text field: we aim to support date/time fields in a subsequent release. Clicking in the field will bring your users to a date picker to help them visually select a date.